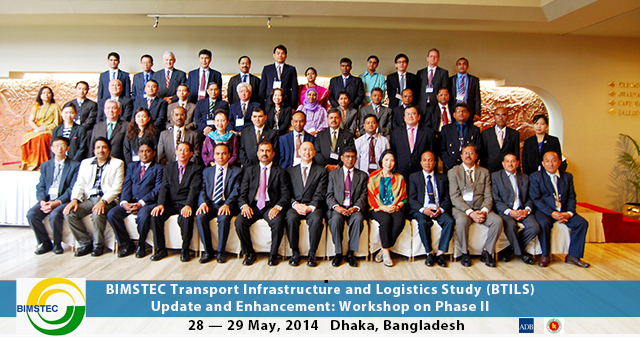 The Workshop on the final phase of the Bay of Bengal Initiative for Multisectoral Technical and Economic Cooperation (BIMSTEC) Transport Infrastructure and Logistics Study (BTILS) was held in Dhaka, Bangladesh on 28-29 May 2014. Senior officials of BIMSTEC countries agreed to recommend policies, strategies, and priority projects on transport and trade facilitation to promote connectivity among the seven member countries. Over 165 projects worth $46 billion were identified. Options for an institutional framework to monitor the implementation of the BTILS proposals. The workshop was co-chaired by Mr. Abdul Sarker, Director General, Foreign Ministry, People's Republic of Bangladesh, and Mr. Kazuhiko Higuchi, ADB Country Director for Bangladesh. In his opening remarks, Mr. Higuchi emphasized BIMSTEC’s key role in linking South and Southeast Asia. Mr. Md. Shahidul Haque, Foreign Secretary, People's Republic of Bangladesh, gave concluding remarks at the workshop.